Laura Furiosi is honored to announce that her company Rashoodz Swimwear has earnt GOLD in the prestigious Mom's Choice Award® in the USA as well as Gold and Silver in the UK Mummii Family Awards, in the space of just three short weeks. Only a few months ago Rashoodz also won Gold in the Australian Mother and Baby Magazine awards. 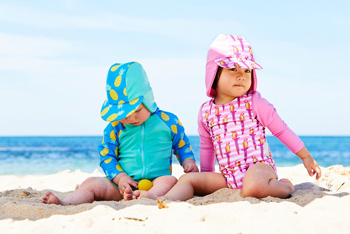 'We are so excited, we've started saying that Rashoodz is the best baby swimwear in the world. We are hope that these awards will help Rashoodz Swimwear be the swimwear of choice for parents all of the globe the next coming year." Mrs. Furiosi says. Having been rigorously evaluated by a panel of MCA evaluators, Rashoodz is deemed to be among the best products for families in the USA amongst thousands of entries from over 55 countries. Rashoodz was scored on a number of elements including production quality, design, educational value, appeal, and cost. "We are thrilled to earn the Mom's Choice Awards Honoring Excellence GOLD Seal of Approval," says Laura Furiosi. 'Having just secured distribution in the USA with North Shore Depot and Baby Mall this will help us get our brand the attention it needs for sales". Last year the Mumprenur launched the Rashoodz Spring/Summer range Rashoodz through holding -Baby Flashmob' at Brisbane's iconic Southbank Beach. This made headlines across the world and their videos went viral achieving an estimated 95.6M online readership 10M estimated coverage views 300 social shares 2.01M circulation. Rashoodz CEO Laura Furiosi says 'achieving these awards and success is a dream come true and validates the hard work it has taken to get to this point. I am not following the traditional rules of business, and it seems to be paying off. I still am a stay at home mum of three and I've been creative with how we get Rashoodz Swimwear out to the world. The baby flash mob was just one idea of how to get the brand awareness without the high cost of marketing. Stay tuned for what happens this year"